More than 185 members attended the October Representative Council, including 23 participants in ETFO’s Leaders for Tomorrow program. It was a busy meeting with committee elections, a test of electronic voting and 25 motions to debate. 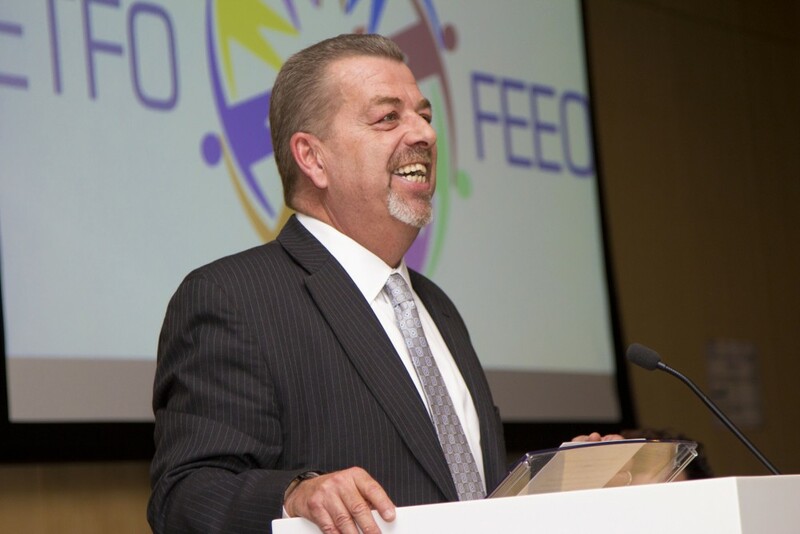 President Sam Hammond opened the meeting with a thank-you to those who have made recent noteworthy contributions to ETFO’s programs and services. The meeting coincided with considerable media attention on ETFO’s new workshop on white privilege. He pointed to how one negative column about the program had ignited an extensive and constructive discussion in the media, with many giving ETFO kudos for taking on this anti-racism work. He referred to the program as one of the many ways the union is taking a leadership role. He reminded members that work in the area of LGBTQ issues received a similar response many years ago, but despite the initial negative reaction, we went on to make a difference. In bringing members up to date on collective bargaining so far, President Hammond reported that the ground rules for central bargaining have been established and the process for determining central and local table items is underway. He emphasized that all parties have agreed that there will be no bargaining in the media and have committed to hold respectful discussions. ETFO members can stay up to date on the progress of collective bargaining at etfocb.ca. Members welcomed BCTF President Jim Iker to the meeting to talk about the challenges British Columbia teachers have faced in fighting for such issues as smaller classes, class composition, more specialist teachers and more special education support. Iker outlined in detail the long history of events that led to the five-week strike this year, including the stripping of collective agreements in 2002, the BC Supreme Court rulings that deemed the contract stripping as unconstitutional, and the court appeals by the BC government. He explained, “Our bargaining was about protecting our court victory.” Iker said the BCTF fight was public because members wanted it that way. Stories about classroom challenges in the media were effective in educating the public about the issues. He expressed his thanks to Hassan Yussuff, president of the Canadian Labour Congress, for the vital role he played in getting the government to agree to mediation to achieve the agreement that was ratified on September 18, 2014. Iker thanked ETFO members for their unwavering support and the donations to support their BC colleagues. Over the last four years, ETFO has been in a unique position in Thailand through a partnership with Right To Play (RTP) to support the Right To Play Thailand Team and educators from the Royal Thai Ministry of Education in the design, development and implementation of the National Life Skills Curriculum. The partnership has responded to the needs of local teachers, infusing their Thai national realities with our expertise and resource support. Delegates from the Royal Thai Ministry came to the ETFO office as part of their September 2014 Toronto Study Tour to learn from the professional learning experiences of the Elementary Teachers’ Federation of Ontario and to recognize ETFO’s contribution to Thailand’s life skills curriculum. ETFO held its annual Leadership Training Conference at the ETFO Provincial Office this fall in two stages. Local leaders and Social Justice Chairs attended in September and PA/PR, PD/L and Status of Women chairs attended in October. The theme of the conference this year was Learn – Connect – Network – Support, with a special focus on increasing our understanding of Aboriginal issues. Keynote speaker Dr. Duke Redbird spoke to conference participants about Canada’s Aboriginal history. Roseneath Theatre did a reading from “Spirit Horse,” an award-winning play about two First Nations youth who are caught between two worlds – the traditional ways and the modern ways of the city. Adapted by celebrated Ojibway playwright Drew Hayden Taylor, the play toured some northern schools in 2010 and begins its southern tour next spring. Leadership attendees received an overview of our “White Privilege” workshop and participated in other sessions to strengthen their awareness and advocacy as leaders. A wonderful opportunity presented itself a couple of years ago when I applied to take part in Project Overseas. This is an excellent professional learning opportunity where teachers can learn and teach at the same time, while they help to build a global professional learning community.